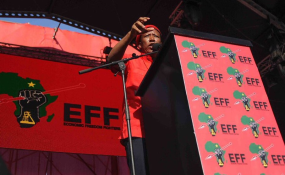 Economic Freedom Fighters (EFF) has called on government of Zimbabwe to lift the Internet and Social Media Shutdown saying it is in breach of people's rights. In a statement EFF Commander in Chief, Innocent Ndibali said government's shutdown of internet and social media puts people's lives at risk. "We know the government used the cover of this communication blackout to continue with its brutality. We are warning that the truth will come out and we will hold the government responsible for the acts of brutality against the people. "Going forward, we call upon the government to immediately lift internet and social media shutdown. We also call upon the government to end its reign of terror on its citizens immediately." said Ndibali. Last week the government shutdown internet twice, denying citizens access to social media platforms and has to this day not provided clear reasons behind the move that has been condemned worldwide. It was later restored but social media platforms are still closed with people accessing it via virtual private network (VPN). EFF told government to end its reign of terror on citizens immediately and to provide free healthcare to people injured during the mayhem. "We demand that the government provides free healthcare / treatment to all those injured during this time. We also call upon the government to provide assistance with funeral expenses for those who lost their loved ones. "We demand that the government reverses the fuel price hikes immediately. "We demand that the government recall the military back to the barracks immediately as they have no business in policing," added EFF.